Use for the SIP suspender on suspension towers. Mounting of clips does not require use of the fork spanner. The clip is made of a corrosion-resistant aluminum alloy and of weatherproof plastic. 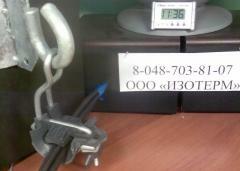 Unbelievable price on Clip the SO239 type supporting for SIP in Odessa (Ukraine) company Izoterm, OOO.